Building camaraderie is a must for every company, and is especially important for small teams of people who need to work closely together. Teambuilding has a lot of benefits; they can be fun and an excellent way to get to know the people you work with better. And, it’s the best way to get a better idea of the true nature of each individual that you work with. While most teambuilding options revolve around going to parks, resorts, beaches and other places of leisure or pleasure, there are a myriad of other options that don’t only count as fun and informative, but also very educational. What better way to bond with teammates and co-workers while learning a little extra something at the same time than to opt for wildlife encounters? Unlike most typical forms of team bonding, wildlife encounters, especially of the slithery kind, is a great idea to suggest for your next team outing. 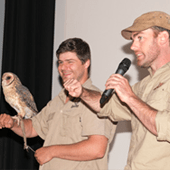 Black Snake Productions specialises in just the thing – with an in-depth tour of their very own snake and reptile sanctuary where you get to be up-close and personal with snakes of all species and sizes, plus a bevy of other reptiles besides! While you may think that getting close with reptiles is not a very good idea, or if you feel squeamish about being around them, the folks at Black Snake Productions will readily put your fears at ease. Theirs is a staff of expertly trained handlers with years of professional experience that guarantees that each up-close adventurous look at their amazing reptiles and snakes is a safe, fun, and wholly enjoyable one. But that’s not all that there is to it! At Black Snake Productions, they do more than just show you which snake are which. For a truly fun experience, their wildlife encounters also extend to a running educational and informative take on the secret lives of snakes and reptiles, their innumerable quirks, and their amazing abilities that most people would probably be unaware of unless… they watched NatGeo on a 24/7 basis. Have fun as you handle live snakes (safely! ), and regale yourselves with wonderful memories with your co-workers and the amazing and fascinating animals you’ve been with. At the same time, learn how to help conserve the dwindling habitat of snakes and other reptiles, know just how many snakes there are in the world, which ones are dangerous and which ones are a-OK to keep as friendly pets. You and your coworkers will have a time to be remembered, and you’ll have the seeds of what can be a worthwhile fascination and a respect in nature germinate in you and your team’s consciousness!